Starting from the top, the high-end YKK waterproof zipper keeps all your stuff dry, and conceals a padded pocket to fit up to a 15-inch Macbook Pro (it snuggles my 13-inch MBP in there perfectly), a second pocket that keeps my iPad Air 2 in place, and a large inner area that fits my power cord, my DSLR, a book (or two), and all the power chargers and cables I can stand. The Waterfield-exclusive gold lining helps me find all this stuff easily, and there’s another little flap with two large and three smaller (pen-sized) pockets stitched in to help partition out the gear when I’m feeling extra-organizational. There’s also a key clip attached to a tear-resistant ribbon stitched inside, if I ever need to keep my car keys out of my pockets. The front of the Cargo Laptop Bag is a thick flap of leather with a seriously solid, unique-looking buckle that has its own diagonal zipper pocket on it, which unzips onto a large, thin pocket as well as a sewn-in secondary pocket that fits my iPhone 6 Plus with wallet case easily. The leather (which comes in both brown and black) is already scuffing up nicely, making an already gorgeous cargo bag even more attractive. Even better, the front flap doesn’t cover the main compartment, so I never have to un-flap when grabbing out the good stuff inside. What the leather flap does cover, however, is a nice, curvy “moon-shaped” pocket that hides yet another area for storage and a secondary stitched-in pocket that fits my iPad mini perfectly. I add an external battery charger in here, but it would also fit books or even my camera, as the pocket angles out and expands to a nice size without ruining the outer lines of the overall bag experience. The seatbelt-style, adjustable shoulder strap includes a removable, non-slip and cushioned shoulder pad that helps distribute a heavy load while saving your shoulder, and the leather-wrapped briefcase handles make this an easy carry when I’m headed into an office or coffeeshop with all my gear. I love Waterfield bags; they’re an essential part of my daily work. I typically get all I need in their great Staad Slim backpack, which features many of the same design language as this newer Cargo Laptop Bag, just with less capacity. I also love Waterfield’s Outback Solo for smaller outings. From now on, the Cargo Laptop Bag is my go-to when I’m looking at taking a few more things with me, especially when I need a carry-on or bike bag that looks as good on my back as it does near my feet while I work. 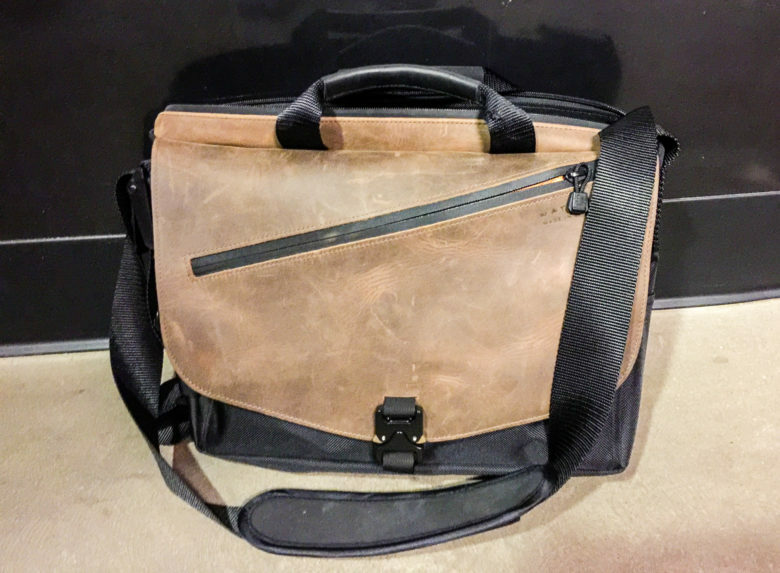 While the price is definitely more than I’d typically pay for any other messenger bag, the custom styling and well-thought-out design work on the Waterfield Cargo Laptop Bag more than justifies the $349 cost; you won’t find a better, more useful and attractive messenger out there. Waterfield provided Cult of Mac with a review unit for this article. Check out more Best List reviews. Read Cult of Mac’s reviews policy.